We’ve kept it secret this whole time but it’s finally here… the AppTweak ASO University has opened its doors! Discover App Store Optimization through fun and easy video tutorials. Learn how to boost your app rankings with various simple tips & tricks. Follow our lessons and start increasing your organic downloads now! For those of you who didn’t know, App Store Optimization (ASO) is the process of improving the visibility of an app in the App Store. Since people usually discover apps by searching directly in the App Store, it is essential to optimize your app discoverability. ASO can help you - just like SEO does for website - to increase your rankings and therefore to drive more organic and quality downloads. It is, at the same time, a very efficient way of drawing more engagement from your users. With more than 1.3 million apps in the App Store today, it is increasingly difficult to be found by users. However, the majority of these apps are losing a lot of their potential since they simply don’t work on their ASO. Along with other app marketing techniques, App Store Optimization is absolutely necessary nowadays in order to succeed in this wild apps world. The good news is that you can optimize your app very easily by working on various factors. These factors are for example your app name, description, keywords, screenshots, reviews & ratings etc. They all have an influence on the App Store algorithm and therefore on your app rankings. There are actually simple tasks that you can easily achieve in order to improve these factors. However, it is important to keep in mind that ASO is not a one-shot. It’s actually an ongoing process that needs to be revised and updated on a regular basis. Indeed, trends are changing very rapidly in the apps world. It is highly recommended to track and monitor how your market, as well as the App Store, are evolving if you want to maximize your chances of being found. 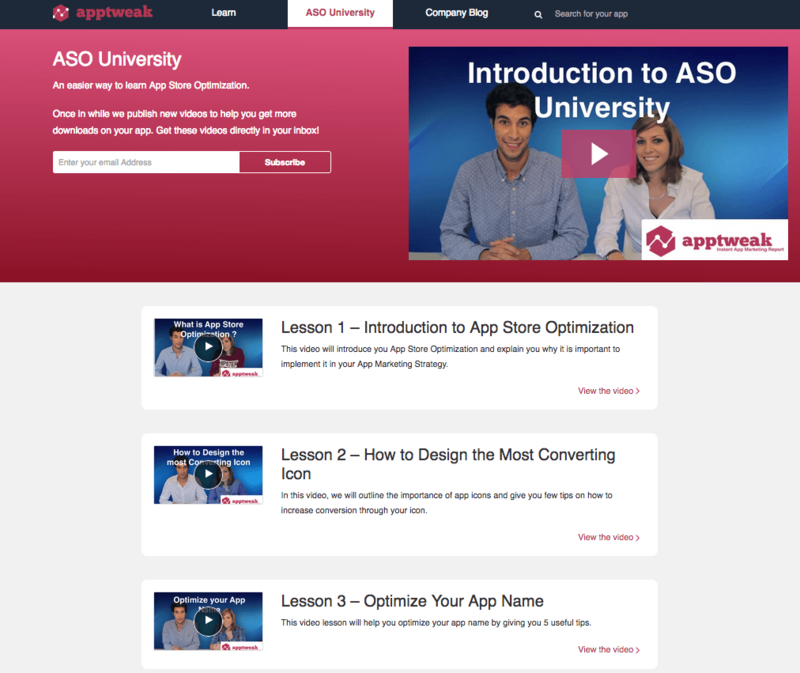 AppTweak ASO University : Free Video lessons just for you! Since we know that ASO can be overwhelming, the whole AppTweak Team decided to put in place a series of ASO videos teaching you App Store Optimization. We’ll start from the very beginning, so if you’re new to this, or willing to review the basics, you’ll probably love our lessons. In time, more and more videos will be posted, getting increasing specific and going deeper in the subject. We want you to become a true App Store Optimization expert, ready to face your competitors and the outrageous number of apps in the store! This is why we’ve created an App Store Optimization platform providing you with a personal and Instant App Marketing Report reviewing all the important factors of your app and giving you personal recommendations on how to improve them. This is also why we offer you powerful app analytics and an efficient way to analyze your competitors. And also why we built up our own native keywords dictionary helping you to find the best keywords for your app in English, French, Dutch and Spanish. Finally, that is why we create and share useful content on app marketing and ASO through our blog. Since we know that it can be tiring to read tons of content, we thought of making these easy-to-understand videos so that you can learn ASO without making any efforts. We really want to guide you, hand-in-hand though the whole process of App Store Optimization. Just sit back, relax and enjoy for free these short videos (3-5 mins) presented by experts members of our team. Along with this great news, let us also introduce you to our new blog. It’s been entirely redesigned with a new interface making the navigation much more smoother and easier. We’ve actually divided our blog into 3 main sections: Learn, ASO University and Company Blog. This section is full of blog articles covering various aspects of App Store Optimization and App Marketing. You will find a lot of advices on how to increase your app rankings and downloads. You will also find extended articles covering broader subjects such as App Store news and trends or useful tools to implement in your app marketing strategy. Actually, you can contact us if you want us to review your tool or service.We’ve created several categories so that it’s easier for you to find what you’re looking for: development, design, promotion, discoverability and monetization. You can also find out the most recent and the most popular articles in just a click. We’ve just talked about it, this section is dedicated to our ASO University. You will find here all our video lessons. Don’t hesitate to drop your email if you want to get these videos directly in your inbox. You can also send us your questions or suggestions on what subject you would like us to cover in our next videos. The ASO University has been made especially for you, so we will take every feedback or requests into account - we always listen and reply. We’ve also dedicated an entire section of our blog to our company. You will find every article related to AppTweak as a company. News, improvements, releases, events or anything concerning our team will be posted here. If you want to stay in tune with the evolution of our platform and our new functionalities, this section is for you! What do you think about our ASO University? Do you think that it will be useful to you? What subject would you like us to cover in our video lessons? Drop your feedback and suggestions below, thanks!